When looking at the destiny of enslaved Bulgarians in Aegean Macedonia and at what they have suffered during the last 90 years two curtains that tightly screen their past have to be raised. The first curtain had been dropped by our totalitarian regime which in the name of misunderstood and foreign international interest blared forth that our relations with their enslaver Greece were perfect and that "there were no problems between the two nations and countries". When one speaks in his or her mother tongue at home on public places and that is why is being brought into jail - this is no problem. When the children are told every day that they are pure-blooded Hellenes and are persuaded to swear before a priest that they will pronounce no word in their mother tongue any more "the language of our enemies, Bulgarians" - this is no problem! When the Phanariot priests preach God's Word in incomprehensible language - this is no problem. When one madly brave village priest reads a sermon in his mother Bulgarian tongue and that is why he is brought into jail - this is no problem! When your compatriots are denationalized, assimilated and killed off - this is also no problem! The second curtain had been dropped by the Greek State. It is a relative of the Berlin wall and still remains untouched. This curtain-wall has wonder features: from Greece to Bulgaria it allows any Greek to pass undisturbed whenever and as many times as he wants to come to Nessebar or Pomorie to pay respect to his or her grandparents. This wall is passed when teachers from the Greek Ministry of Education want to come. They come to organize courses on Greek language for some Greek emigrants. It is passed by some dance groups which show Greek dances and songs. There is nothing easier for hundreds of Greeks than to come to Sofia and to open shop, company or bank. Try however to pass through this wall from Bulgaria to Greece. If you travel by a luxurious tourist bus on a journey to visit the Acropolis there will not be any trouble. But if you, as a descendant of Bulgarians chased from Macedonia, try to visit Voden, Lerin, Kostour or want to see and know your relatives left there, the wall is bullet-proof. If the hounds from the Greek consulates become aware that you were born in that region or that you have relatives there the wall becomes something more than the Majino line. Nobody ever will give you a visa. To say nothing of a permission that you could open a shop, company or bank there. I would never believe my eyes if the Nevrokop priest Natanail, in spite of the fact that he has graduated theology in Athens, gets a permission to perform even one liturgy in Bulgarian language at the Bulgarian church in Lerin while the Greek church in the Center of Sofia resounds with chants in Greek. The aim of this booklet is to help these curtains to be pulled down so that light and fresh air could get in. Let our unhappy compatriots feel that they are at the threshold of 21 century, that Greece fulfills honestly and publicly the obligations taken with certain international contracts and convention and keeps the human rights of its citizens - our compatriots. We want nothing more than the Greek state wants for its compatriots for example in Albania, i.e. the right to speak in their mother tongue, the right to have their own school and to have the Bulgarian orthodox church. In the name of the future European home, of peace and understanding in the Balkans, in the name of Greek's own interests we address to the orthodox Greek people, to its intellectuals and thinking people with the appeal: We do not want any territories. We want human rights for our own brothers in Macedonia. We want democracy in Greece to be valid also for our compatriots living there. The sooner this happens and the wall that separates us falls the better for you, for us, for the coming generations. Please, help us to build together a new, clear and smart Balkan stage of our new European home! As it is known after the Balkan Wars 1912-1913 the biggest part of Macedonia (52%) was given to Greece. Even till 1988 the Greeks called this part of Aegean Macedonia "Northern Greece and Thrace". Since that year the province has the name "Macedonia". The current roots of the violation of human rights of ethnic Macedonian Bulgarians in Greece are based on the events that occurred in 1913. At that time the Greek soldiers committed outrageous atrocities over the Macedonian population /see below/. What is happening in these territories nowadays could be read in the publications of two journalists. The English journalist W. Hild in his publication "Traveling through Aegean Macedonia" tells that he has ascertained ,,brutal violence over the local population, desecration ofgraves, breaking of grave crosses inscribed with Slav letters, even erasing the graves and burning the bones". The Australian journalist Bert Birtles in his book "Exile from Aegea" published in 1938, states "Greece does not have a Jewish problem but a Macedonian one. In the name of Hellenization the local Slav minority is chased and arrested for unimportant reasons. General Metaxas' policy to inculcate his own national spirit in the Bulgarian minority brought the changing of the native Bulgarian names with Greek ones and the prohibition of speaking in mother tongue. These countrymen who did not obey his orders or those, who tried to oppose were resettled on Greek islands without any proceedings". Very little has changed since that time. The disfranchisement of Macedonian Bulgarians from human rights is not only a memory from the 20s and the 30s of the last century. It continues even nowadays. During that time as well as nowadays the assimilation machine works on high revolutions. The surnames and family names are changed by force, communication in the mother tongue is prohibited, Bulgarian language is eliminated forever from schools and churches, the authentic names of towns, villages and countryside are Hellenisied, there are no newspapers, books and broadcasting for the local population. The folklore, the style of living, the customs and the spirit are treated as Greek. The statements of Mr. Burtles will be confirmed by respective proofs taken from official Greek documents and published in Greek newspapers and magazines. 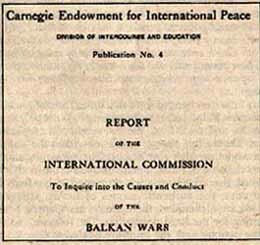 We have the facts for the violence over the Bulgarian population in 1912-1913 thanks to the official report of the International Commission for investigating the causes for conducting of the Balkan Wars, established by Carnegie Endowment for International Peace. In the International Commission took part: Dr. Josef Redlich from Vienna, Baron Constant d'Estumel - Senator and Justen Godart - Deputy of French Parliament, Dr. Walter Schbcking - Professor from Marburg, Germany, Francis Hirst - editor of the Economist, Dr. H. N. Brailsford - England, Professor Milioukov - Member of Russian Parliament, Dr. Salomon Dgon - Professor from Columbia University, USA. The Carnegie Inquiry was published in English in 1914. The same report was republished again in 1994 in USA with foreword by the famous American policy expert M. Cenan. The republishing of the book became necessary for two reasons. The first one is the higher interest in Balkan problems as consequence of the war in Bosnia and Herzegovina. The second one is the organized destroying by the interested parties of the copies of this report in almost all big libraries all over the world. This 415 pages report is accompanied by numerous documents and maps and with academic precision reveals the truth for the causes and the way the Balkan Wars 1912-1913 were conducted. The objectivity of the Commission can be illustrated by a single example, namely, the storm caused in the European press by the Greek propaganda against "the Bulgarian atrocities" exerted on Greek church leaders. The report established that: ,,Unlike the Bulgarians, the Greeks welcomed most kindfy the foreign military correspondents and provided them with various information. Bulgaria was in a state of isolation and its telegraphic connections were disrupted. Thus, for example, the newspaper � Tan " reported that the Bulgarians had hanged the Greek Bishop in the village of Doyran. But two months later we met him in person and spoke to him. A memorial service was held for the Bishop of Kavala; however, we met him some time later in Kavala. The correspondent of the above-mentioned paper also claimed to have attended the funeral of the Bishop in Seres, the latter having been put to cruel torments before being killed. (See the report of 23 July, from Livonovo.) That very Bishop was seen by us to perform his church services." (For references, see the Report, p. 78). The tragic fate of Bulgaria, and Macedonia, respectively, was conditioned by the geopolitical interests of two empires. The Austro-Hungarian Empire had set itself the task to usurp Bosnia and Herzegovina in the Balkans in order to get an outlet on the Adriatic Sea. The same was the purpose of the Serbian Kingdom. And, instead of seeking for an extension westwards, Serbia was pushed to look for territories to the south, along the valley of the river Vardar, and with the approval of Vienna. The British Empire restored Greece which had fallen under Turkish power. In order to protect its Imperial naval routes, England directed the Greek authorities to seek for an extension to the north, at the expense of the Bulgarian Slavonic population. The purpose was to close up the road for Bulgarians towards the Aegean Sea. With the collaboration of its protectress, Greece moved to the north, starting from Epir and Thessalia, and penetrated the Turkish Empire, establishing Greek colonies on the Bulgarian ethnic territory - both in the towns and in the seaside villages. The Greek system of state began penetrating Macedonia with the overall collaboration of the Greek Orthodox Church. After the establishing of the Bulgarian Exarchate in 1870, a harsh struggle began between Greece and the Bulgarian community, aimed at winning over the national awareness of the population. The Greek Orthodox Church served as a weapon of the Greek propaganda. The efforts of Greek propaganda were aimed at the Bulgarian population of Central Macedonia, i.e. the region bordered by Kostour - Seres to the south and by Ochrid - Prilep - Stroumitsa - Melnik - Nevrokop to the north. Following Greece's defeat during its 1897 War with Turkey, the Bulgarian national idea took over the Greek propaganda. IMARO was successful in overcoming the Graecoman's influence. The Ilinden Uprising of 1903 struck the public opinion in Greece. It caused panic among the Greek state authorities who saw the danger of a complete failure of their plans for conquering Macedonia. These authorities were not so much troubled by the development of the military actions but rather by the overtures made by the Great Powers for a political settlement of the Macedonian question. In order to exert ifs influence with a view to achieving an outcome positive for Greece, the Greek government decided to make use of the disastrous end of the Ilinden Uprising. The only party to win anything at all from the Uprising was Greece. Every textbook in modern history in Greece contains a chaptered titled ,,The Macedonian Struggle". In 1904, the Greek government of Theotokis, on the advice of London, took energetic actions in Aegean Macedonia. A special committee ("Makedoniki komitato") was established in Athens to organize armed struggle against the Bulgarian population. Four officers were sent, among them Pavlos Melas, at present a Greek national hero. The Greek Embassy was re-structured and competent diplomats were sent there. In accordance with the preliminary plan for military actions, in 1904, the first Greek armed detachment was sent to the region of Bitolya, led by the above-mentioned Pavlos Melas; however, it was defeated near Kostour. According to the plan, the rebels had to terrorize the Bulgarian population, to support the Graecomans, and to establish points of support for the new detachments coming from Greece. Melas was replaced by A. Santouris with a new group of officers. Throughout Greece money was raised to support these detachments. In early 1905 new detachments were recruited (from Cretes - Mani, Roumeli, etc.) which were generously endowed by the Greek government with money and armament. On the example of the organized local Bulgarian population, the Greeks created supportive local forces and, through these Graecoman's units, organized in 1906 in Salonica military groups of young Graecomans led by Lieutenant Soumatis. Their purpose was to kill eminent revolutionaries of IMARO. These activities also involved the governing bodies of the Greek Church led by the Metropolitan Bishop Germanos Karavangelis who, together with the consuls Evgeniadis and Stornaris in Salonica led the invasion of the Greeks against the Bulgarian spirit and culture in the region of Kostour. The huge amounts of money available were distributed by two banks in Salonica which were established to serve special purposes. One of the banks was to transfer the money for bribing the Turkish pashas and senior officials so that they supported the efforts of the Greeks in their struggle against the rebellious Bulgarians. In their struggle against the IMARO revolutionaries, the Greek andarts (rebels) made use of information provided by the Turkish intelligence service, and also received frequent help from the Turks. The second bank financed and assisted the Greek tradesmen throughout Macedonia, who were boycotted by the Bulgarian population. In early 1908, the Theotokis government entrusted the leadership of the operation called ,,The Macedonian Struggle" to Colonel Danglis, and Baltatsis was appointed Chairman of "Makedoniki komitato". The commandment was taken over by the General Staff of the Greek Army. Volunteers were summoned and in the 1907-1908 period the detachments grew up to several dozens commanded by regular officers and sergeants. Unfortunately, after the crush of the Ilinden Uprising, the resistance of the defeated IMARO grew weaker, also because of the internal conflicts between the Internal Organization and the Supreme Committee. The 1908 revolution of the Young Turks put an end to "The Macedonian Struggle". The Young Turks proclaimed a general amnesty and promised equality and civil rights to all nationalities. Under these circumstances, the internal conflict between Greeks and Bulgarians ceased. The four-year-long period of struggle proved successful for the Greeks. The Greek supremacy in the southern part of Macedonia was consolidated and a strong Greek presence was established in the disputed central region of Macedonia. The morale of the local population was strengthened up. "The Macedonian Struggle" indicated quite clearly to the European powers that the Greeks in Macedonia were to be the most important factor in the future of the Ottoman Empire. This success was due to the circumstance that the struggle was carried out with the organized efforts of the Greeks of Cretes, Thessalia and other provinces, who helped the local Greek population. That battle involved the whole Greek nation, just like in the 1811 Greek Revolution and the Cretes Uprising in the late 19th c.
According to the British histonan Douglas Denkih, yet another factor contributed for the success of "The Macedonian Battle". That was the broad- scale propaganda carried out among the local Bulgarian population by the Greek Orthodox Church. Although non-Greek speaking, groups of that population helped the Greeks as bearers of the Christian faith against the Muhammadans. 1. He was the first and most fervent champion of the emergence of the andarts (Greek rebels) movement in Macedonia. 2. For 7 years (1900-1907), in his capacity as Metropolitan Bishop of Kostour, he raised the slogan "Let no Bulgarian remain". 3. Together with the officer from the Greek Army, Captain Vardas, he inspired and did everything necessary for carrying out the massacres which shook Bulgaria and the world. The word goes about the assassination of all the people at weddings in the villages of Zagorichane (region of Kostour) and Zeieniche (region of Lerin). Here is his own testimony about the massacre in Zagorichane: "The village had over 600 houses... These were the worst Bulgarians in my diocese. When Vardas decided to punish them, he wrote to me and I sent him the names of our people (agents - author's note), so that he left them alone. In the eve of 30 March 1905, he hid himself with 300 men in the forest opposite the village. Early in the morning they entered the village and began shooting... They killed the people and put their houses to fire. On that day, 79 Bulgarian were killed. Sixty people were killed in the church where a wedding was held. The bride, the bridegroom, the priest, and some other people were slaughtered. Not many of our people suffered because I had given Vardas a list of their names and they had concealed themselves..."
4. Karavangelis also used the services of hired assassins and paid 5 pounds for each chopped off head of people pointed out by the Metropolitan Bishop. In the same way, the voyvod Lazar Poptraykov, who was wounded in the Uprising, was slaughtered by the Graecoman Kote from the village of Rulya, region of Kostour. Karavangelis paid 50 pounds and put the picture of the cut head in his office. 5. As a leader of the andarts' movement, he wrote: "The Greek detachments grew continuously and increased in numbers (he mentions the names of 30 men of Cretes who were in the lead of the detachments). I kept regular touch with them through the Consulate in Bitolya and the Metropolitan Bishops. I personally met them and instructed them to kill all priests and Bulgarian teachers." The actions of that Metropolitan Bishop - a true incarnation of the Satan - was typical of the role of the Greek Orthodox Church in the struggle against the Bulgarians in Macedonia. The Greek efforts for overtaking the territory inhabited by Macedonian Bulgarians proved successful because of the tragic outcome of the 1903 Ilinden Uprising. Our historiographic literature offers no studies in this respect. The efforts of the Greeks to avail themselves of the defeat of the Ilinden Uprising were duly re-paid during the Balkan Wars. Greece achieved diplomatic success unexpected even by the greatest optimists, by gaining 34,603 sq. km., or 52 per cent of the whole territory of Macedonia, which comprised the richest and most fertile land which yields two or three crops annually. Thus hundreds of thousands of Macedonian patriots were pushed away and a bloody process started of Greek assimilation of the Macedonian Bulgarians who had remained in their native land.